Endogard Plus Flavoured Dog Worming Tablets are a broad spectrum, no fuss, no mess wormer for dogs weighing up to 35kg. Developed specifically for the treatment and prevention of Roundworm, Tapeworm, Hookworm and Whipworm, they can be used effectively as part of a parasite control program for your dog. 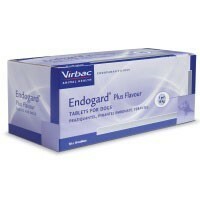 The Endogard Plus tablets have been given a tasty liver flavouring to make them more palatable and therefore easier to administer as your dog will regard them as a treat to be enjoyed. Use 1 tablet per 10kg of bodyweight (for dogs over 35kg please use Endogard Plus XL). The tablet can be given directly to the dog or disguised in their food. Please note that tablets are sold individually. Over time I've tried a few ways of getting our labrador to eat this product... First, the tablets had to be ground to a powder...after some failed attempts, I found that mixing with cheap tuna worked well...but by far the best was mixing the powder with gravy! Good value for money. It is used as a prevention rather than cure on my dogs. Recommend if just by price alone. Very easy to give to my dog, she has them crushed up in sardines! Lot cheaper than the brand we used to get and just as good! My dog spat it out when given by hand, but I mixed it with a little gravy and he swallowed it down whole! BEST PRODUCT I`VE EVER USED ON MY 2 DOGS, EXCELLENT PRICES TOO & I WOULD HEARTILY RECOMMEND VETUK TO ANYONE! Managed to get my smaller dog to take easily enough, like being able to break in half, no side effects and worked at very good price. Effective wormed with no side effects. Easy to give. To a multi dog household, this is a good choice. Very nice price! The tablet is broken in half and disguised in dog food with wet meat. One dog eats the tablet and other usually wont eat it. my dog hates worming tablets and so far from the ones ive tryed this is the only one she doesnt mind!! does the job really well and no blattle trying to get her to take them, also fab price! !